“What people need to understand is that our protest is about taking to the streets, learning about education in the streets, and discussing the future of our Quebec universities,” said professor Anna Kruzynski of Concordia’s School of Community and Public Affairs during her speech at Wednesday’s Zombie Walk/Strike Open-Mic. As I listened to the various speakers—students, activists, professors—speak to the crowd that had amassed in front of the Hall building, and as I spoke to people and photographed their signs and protest materials, it became clear to me that the tuition hike issue is also an arts community issue. “Universities are following the corporate model of management, turning our education into a business venture, a product in a retail store,” Kruzynski said, “and that means that private funding for research will likely go to [the sciences],” leaving arts programs underfunded. Although I won’t get into my own views on the strike here—there isn’t enough space or time—I’d like to dedicate this week’s ARTiculate to the art projects, body-painting, and protest signage that students have created in response to the tuition hike issue. response, and a highly-visible medium for expressing dissent. 2) PAINT ON: Improvised studios took shape along the de Maisonneuve Boulevard pavement, showcasing the widespread use of red as the strike’s colour of choice. The sight of students painting one another in anticipation of that day’s zombie walk highlighted the collaborative effort of the strike project. 3) PORTRAIT GALLERY: I spotted Hannah, an English major at Concordia, in front of the Hall building sketching students who posed for her impromptu exhibit entitled Portraits for Strikers. 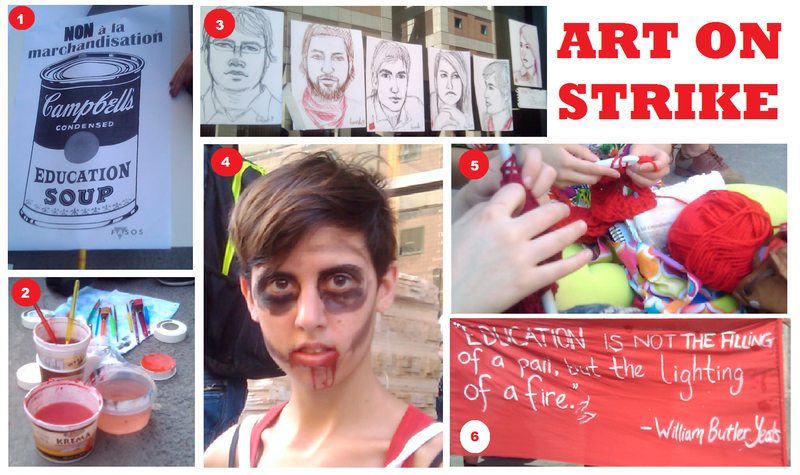 The dignified and simple portraits illustrate that artistic response is varied both in subject matter and in form, and that non-visual arts students also feel creatively compelled to participate in the strike. 4) PAINTED FACES: What was all that painting for? Student Lea shows off her zombie makeup, complete with dark under-eye circles, a bloody mouth, and a dress smeared with black paint and plastered with protest slogans. The zombie march organized by fine arts students was definitely one of the most creative elements of the protest against tuition increases. a little aside of the main action, knitting and crocheting away. Weaving and Time, a project proposed by Katrina Habrich, Hope Phillips and Katherine Spooner-Lockyer, plays on the work of fibre arts in joining and weaving together to symbolize the unity of students during the strike and protest period. The best part? The girls plan to create a huge sweater that can only be worn by several students at once—not that the protesters will need it with the weather we’ve been having. 6) POPULAR POETRY: English department students held a poetry reading/open-mic on the corner of Mackay Street and de Maisonneuve Boulevard, reading both from personal poems and from personal favourites. Two students held up a banner that read: “Education is not the filling of a pail, but the lighting of a fire,” quoting William Butler Yeats.